Last fall, the popular form and survey startup Typeform raised a Series A investment round of $15 million. Since then they’ve been doing an incredible amount of hiring. In fact, they’ve quintupled their team. 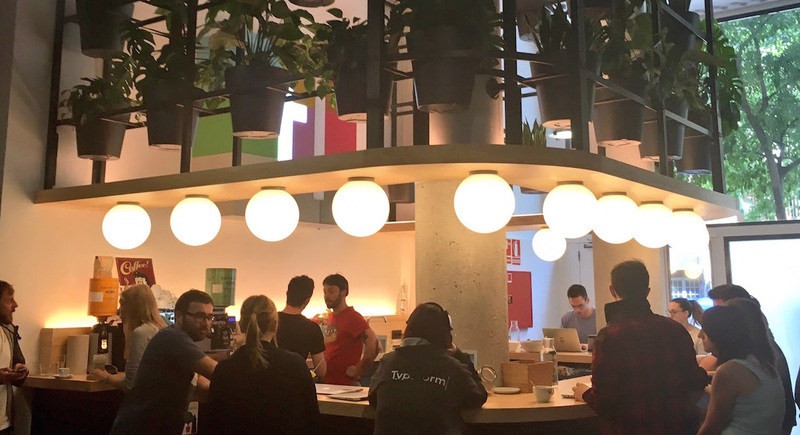 I paid a visit to the rapidly expanding, well-funded startup in beautiful Barcelona (the city that is also home to one of Redbooth’s two offices). 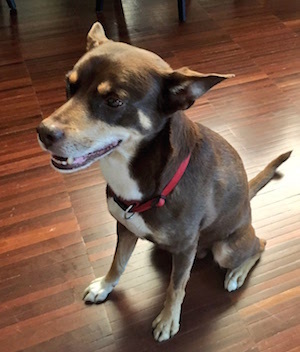 At Typeform, team members call their office a home and refer to each other as a family. Typeform’s mission is “to be a little more human.” And even though I was a little skeptical at first, it quickly became clear to me that they exemplify the next wave of creative-yet-sensible hiring and culture building. What’s that? Why of course, it’s a cross between a receptionist and a barista. At first that had me readying my ample sarcasm, but it was soon swallowed back along with a lovely chai. Barception left me with a lasting, positive first impression — which is exactly why it exists. “Barception has had more impact on the culture of the company than everything else because you start your day very differently when you have a bar at the entrance,” says Gabriela Cantu, Typeform’s Head of Home Team. It’s also become a meeting place for an after-work caña and a way for people in completely different departments to cross paths and connect. Maybe not every startup needs (or can afford) its own version of Cheers at the entrance. But you can think carefully about what you can do to create a wonderful first — and last — impression for team members, guests, and potential employees. I’ve heard investors say it time and again: They’d much rather have an okay idea with a fantastic team than the best idea in the world from an okay team. In other words, the team is incredibly important. It’s hard to imagine disagreeing with that. But if you take a hard look at your hiring process, does it reflect a commitment to thoughtful recruitment and hiring? Can you really judge culture fit in just a few hours of interviews? Can the candidate? Typeform has fully committed to careful hiring, which means giving it plenty of time. They involve as many team members as necessary to recruit even just one person — over lunches, after-work drinks and coffees on their ample couches and bean-bag furniture, so that candidates get a real feel for what it’s like to work in the environment. “You put people in context, you let them experience what it is to be here. You don’t put them in a room and ask them questions about their skills. It’s more about the kind of intuition that takes you to be friends with someone,” Gabriela says. “I’m going to be working with this person eight hours a day, sharing my life with them, so we better make sure this person will be happy and fit in with the rest of the team,” she adds. Typeform’s Head of People Operations (their version of HR), Georgina de Sola, says there may be even more exploration in the works: Typeform occasionally employs a workshop to actually see the candidates in the working environment with their prospective teammates. Startup and technology industry perks are notorious for being extravagant (although some companies are starting to rein them in). Especially at their new HQ, Typeform is taking very specific steps toward increasing employee comfort — but without blowing budgets or bellies. “There are companies where you probably have free snacks the whole day or many more perks or all-you-can-eat buffet, but this is not quite the style here,” Gabriela says. Typeform offers one simple, balanced lunch a day along with a vegetarian option, plus local fruits and vegetables for snacking. The company doesn’t supply sugary snacks or chips, though of course employees can bring in what they want. But the thoughtfully conceived perks don’t stop with lunch. 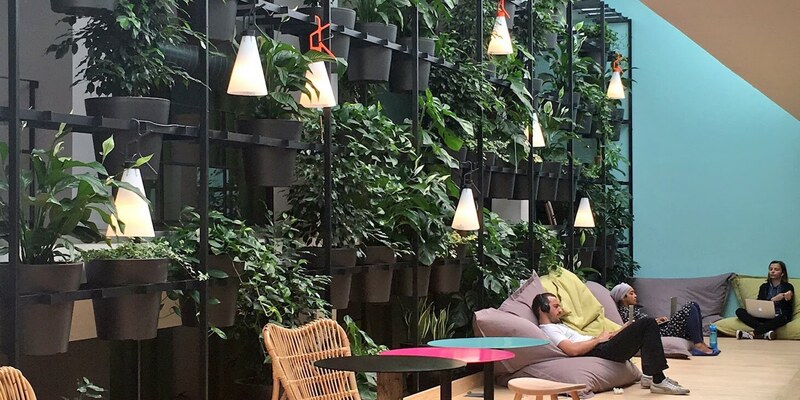 The most memorable aspect of Typeform’s new office is how green it is. Thanks to 720 enormous plants, to be exact. Inspired by Dr. Kamal Meattle’s TED talk “How to Grow Your Own Fresh Air,” Typeform’s home team — including a part-time gardener — make sure that everyone gets energy and joy from the plants. They’re great to look at, but they also aid in keeping the air oxygenated and helping employees concentrate on their work. 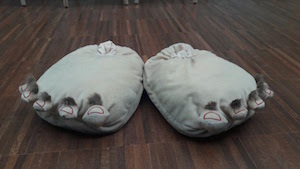 When you join Typeform, you also get a small budget to buy…slippers! Typeform has a big zapatillas (slippers) culture. Employees are encouraged to pad around in their slippers to feel at home. …and it’s getting smarter. Flashy perks are being replaced by thoughtful, beautiful choices that enhance the lives of team members and help them produce their best work. And that’s just smarter business, as it’s proven that happier workers are more productive ones. Of course, the founders of Typeform don’t treat their employees differently just for productivity’s sake — they treat them like they are valued human beings. How is your company showing and sharing your company culture and values? What small steps do you take to create a company that people really want to work at? Tell us below or tweet to @RedboothHQ and @JKRiggins, we want to hear from you!